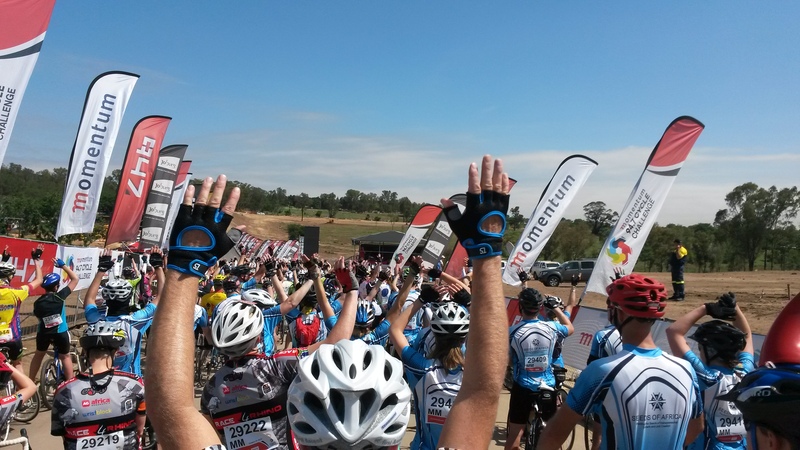 Last weekend I rode the Momentum 947 cycle challenge. I really enjoyed the spirit of the course. I must say there was more supporters along the road than I thought there would be. The large number of participants made it a big challenge to get to the starting point. The new venue will have to be improved to cope with the traffic . The course has more hills than I thought. When I grew up in Durban Natal we all used to say it is flat in Johannesburg. Well try ride it on a bicycle. I think the hills make it more difficult than the Cape cycle tour. On the other hand it made it very interesting to ride. I found that the hills made it difficult to keep my heart rate constant. After halfway I turned the alarm off for my heart rate target zone. Just glanced at my monitor from time to time. Coming from the Springbok flats I am not used to the down hills. Reaching speeds of over 65 km/h can be quite scary. I do not get much chance to pick up speed like that down hill were I live. Then there are other riders that do not hold their line and can crash into you. I saw a few people who had taken bad falls. There was one woman laying in the middle of the road on a steep down hill. Lucky the ambulance was not far away. Other riders behind me said they saw there was a big puddle of blood and the paramedics were stabilizing her with oxygen. Also laying her out straight so they could get her on to a stretcher. That just can take your nerve away. Well a side from the dangers of road racing with bicycles or should I call it fun riding. If you want to see Johannesburg from a different perspective, try riding the streets on a bicycle. I think I rode through the old centre of Johannesburg faster than you could ever do with a car. Went through all the red and orange traffic lights. Roads were empty of cars, that was strange. I have never seen Johannesburg without cars in it. All the road closures for the race made it seem so different. 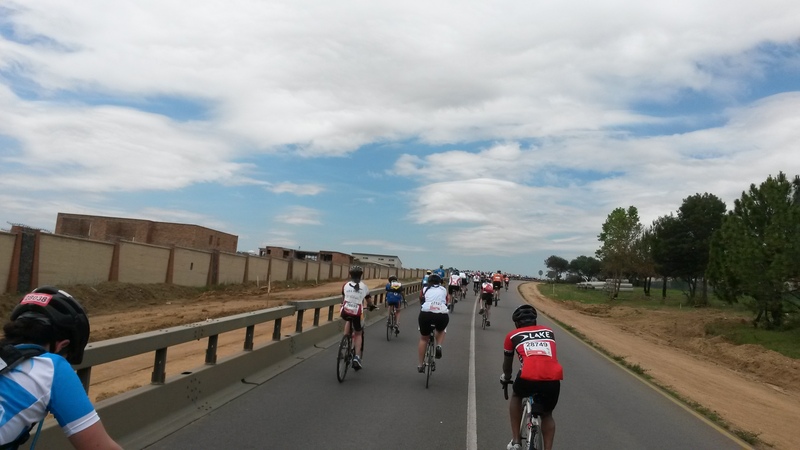 Then there was riding down the M1 highway and M2 highway on a bicycle. If you did that normally the police would come and get you. Or you might be knocked over before they even get to you. The road passed Johannesburg Zoo and going through Randburg and Santon was just a big street party. People playing music,clapping calling out. Then there was all the braais (barbeques) and camping chairs along the road. There was a man offering his beer to me but it smelled like he was burning his meat on the fire. Looked like he had to many distractions to watch how his meat was cooking. Heading north out of the suburbs brought some nice long hills to test your stamina. By this time it had reached 32 degrees. Thank goodness they had placed some sprayers across the road to cool off the riders.Then passing the Lion park was a nice down hill. This tricked me into think it was down hill to the finnish. Well not so fast the organizers made sure there were two monster hills coming near the finnish. About 50 % of the people climbed off and pushed up these two hills. There were riders that did two laps for the day, that makes about 200 km. Then there was Batman. People in Rhino suits and one rider had a Rhino around his bicycle. Others with short skirts on and super hero capes on. Other fund-raising groups helping three wheel bicycles along, dressed in cow outfits. All in all I really enjoyed the ride. 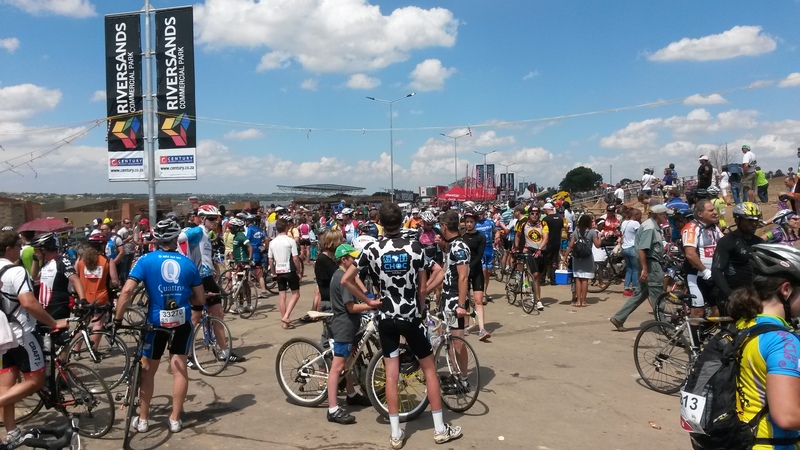 This entry was posted in Bicycle riding, Uncategorized and tagged Cycling, Johannesburg, momentum 947 cycle challenge by krfarmer. Bookmark the permalink.